Australian Policy and History publishes three kinds of articles – short opinion-style pieces, longer, more traditional-style academic papers and policy briefs, written in the style of a public service briefing note. All are written in clear, concise text appropriate for a non-academic audience. The emphasis is on policy relevance, with a clear focus on what can be learned from history for policymakers. Articles aim to address policy significance in a distinctly Australian setting, but through historical research spanning both Australian and overseas subjects. 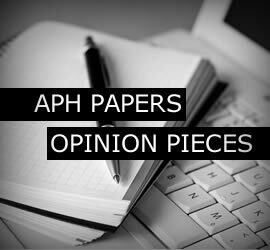 The views expressed in Articles on this website are those of the individual contributors and do not necessarily reflect the views of the editors or other members of the APH Network, its partner institutions, or any affiliated organisations. The APH Network does not guarantee the accuracy of the information provided in Articles and accepts no responsibility for any consequence of its use. This website and its contents are subject to copyright under the laws of Australia and, through international treaties, other countries. The copyright in materials in this website as a whole is owned by the APH Network. Third parties own the copyright in some materials incorporated within this website. You may view this website and its contents using your web browser and save an electronic copy, or print out a copy, of parts of this website solely for your own information, research or study, but only if you: do not modify the copy; and include the copyright notice “© APH Network and contributors (year). All rights reserved” on the copy. You must not otherwise exercise the copyright in the whole or any part of this website for any other purpose except as expressly permitted by statute or with the APH Network’s prior consent.